We arrived early, not really knowing the parking arrangements and we parked on some side road about 15 mins walk away from the start. Once we got to the starting area we saw that we were pretty early (about an hour to be fair). So we had time to look around and talk to a few people. As there was a fun run at the same time, there was on the day registration for those people who were not going to be able to conquer the 10K, and therefore doing the 2K instead. 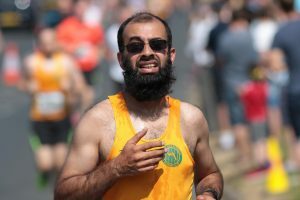 I managed to meet up with many Striders and non-striders alike, and most people were discussing the heat, and how no one was going to attempt a PB. I think I was the lone person who was attempting to try. Most people were just happy that they’ll finish the day. Going to the start line, there were marked areas of where to stand for the time you think you will attempt, as I was “trying” for a PB, I stood between the 50 and 55 min markers. It would be really cool next time if we had pacers which would mean that we don’t need to worry about looking at our watches or seeing that we are on track or not. We started on time, as per usual, with any race (you expect that now). And I went off at a really good pace. My aim to get a PB was approximately at 8min/mile, but when setting off I felt pretty comfortable with 07:30, so I let my body glide this pace. Facing the first hill, I thought, “hmm, this doesn’t seem that bad of a hill compared to my usual training runs”. I was a lot more used to doing Church Street and Herries Road in Hillsborough through the weekly Wednesday Strider training runs. I kept with the pace to the top of the hill and felt really good. Coming down seemed a lot easier. So getting to the 2.5-mile mark I had already conquered most of the route, so looking at my pace, I thought this is looking good, and with the next hill to come, to slow it down a bit. Coming down to 8min mile, I should easily get to my target result now. This was a welcome slow down, as I found the hill tough with the heat. I found one or two striders starting walking now, but I wanted to keep going even if it was slow. I knew once I conquer this hill, there will be some respite going downhill again. Fortunately for me, I was able to pick up the pace slightly again to try and compensate for the slowness. This was overall repeated again for the second lap round too. The 0.25km was over the pavement and going into the park, and thinking I had the energy to try and sprint, I tried my hardest to get over the line in with great determination, which is visible in the above photo (I’m the one in the beard on the left with a yellow vest). What I can say, is that I beat my PB by 5 mins and 7 seconds with a time of 47:37. Throughout the race, I did not look at what the target was going to be and didn’t even estimate. I let my body/legs carry me in the best effort I can get through the race. This is the reason, why I keep saying to people that this was an unbelievable race, as I could have not have imagined a time and with so much improvement. Now that I have reached my target for 2018, which was a sub 50 10K, I need a new one. Maybe I can try a 45min 10K for 2018, which I think should be achievable. One of the Strider run leaders has already hinted me at that for my next race. Let’s see how that goes in Leeds on 18th July, watch this space. As always, there are a lot of people to thank, who have guided and have helped me to get to this position. 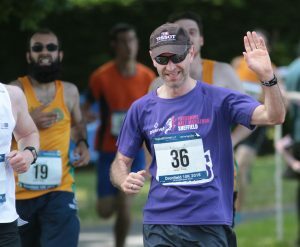 But the key is the run leaders and coaches that are with the Steel City Striders. I would love to somehow in the future repay the Striders on the encouragement, the friendliness and the support that they have given me thus far.